UPDATE August 17, 2007: Bill confirmed that they have restored communications with the outside world and have shipped all orders that were held up due to the phone/internet problems. They are in business and have a new video on the website demonstrating the product. Check it out! UPDATE August 15, 2007: After receiving word from one of my readers that the folks at Cooktopcover.com are unreachable, I tried to contact them myself via phone and email. I was also unable to reach them via phone so I tried sending an email through their registrar. Bill Miller responded, letting me know that they are indeed still in business, they were just unfortunate to be caught up in the Sunrocket bankruptcy, which suddenly and without notice left them stranded without phone or internet access. They are getting all their services restored with a new provider and should be fully operational soon. Thanks for your patience while they sort out their situation. 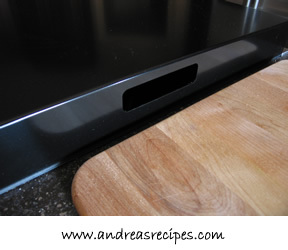 When we moved into the new house in March, I posted about adapting to the new kitchen and showed a photo of the cooktop in the island, noting that there was no safety lock on it to prevent the boys from turning on a burner. Our previous kitchen had a gas range with an electronic system which locked out both the oven and the cooking surface, a safety feature that we found to be very helpful. So one of our first purchases for the house was a cooktop cover designed to cover the entire cooking surface and hide the burners and knobs. After shopping around for a bit, we ordered our cover from www.cooktopcover.com, which is based in North Carolina. They have one standard size that fits many 30-inch cooktops, and it’s reasonably priced at $99 (cheaper than a trip to the ER), although you can order a custom sized cover for additional cost. The cover is made from pressed 0.08″ thick aluminum alloy, has industrial powder coat paint, and weighs about 8 pounds. Supposedly it will support up to 190 pounds, not that I ever plan to put a 190 pound object on top of it, but it’s comforting to know that it can stand up to a bit of abuse. It certainly feels more substantial than most burner covers. WARNING: While the website notes that this cover can be used on both gas and electric cooktops, they post a strongly worded warning that it is not safe to use with a pilot light. If your gas cooktop has a pilot light, do NOT use this product. After submitting my PayPal order online, the cover arrived in about five business days. I knew it was going to fit a 30-inch cooktop, but I was still surprised at how large the box was. The cover came wrapped in paper for transit protection. One of the first things I noticed was the handles cut into the sides for easy lifting, a nice touch. The second thing I noticed was that the cover did a great job covering the knobs and it was the right height for our GE cooktop. The third thing I noticed was that when we took it off for cooking we needed a place to put it. Now why didn’t we think of that before? For now we just stand it up next to the end of the cabinets, and the boys have left it alone. If they start messing with it we’ll have to revisit that issue. Joyce Miller of Cooktopcover.com slides her into the pantry, but my pantry isn’t big enough for it. We’ve been using the cover for over a month now, and we really like it. The website promotes how it gives extra counter space when in use, and it really does. We can now use that cooktop space in the island for serving space when we have company; a nice bonus. The only thing we did extra was to add some rubber strips along the bottom edges. It probably would not scratch the counter top, but we wanted to be sure. We purchased some of the rubber strips that you put on the edges of your car doors, an easy and cheap solution. Pros: Well made, fits many brands of cooktops, works on both gas and electric ranges, reasonably priced. Cons: Not safe for cooktops with pilot lights. Storage is an issue when not on the cooktop. Materials: The standard cover is made from aluminum. Stainless steel is available as a custom order. Thanks for this information. I also have a gas cooktop located on my island and my children are right at the age where they can turn the knobs and mess with the burners. I can definitely use something like this. We are very glad that we bought it for our cooktop. I feel a little safer knowing the boys can’t just reach up and turn on a burner. Ooh, we’ve been looking for a cooktop cover for our new electric cook top. Thanks for posting this, because I’m definitely going to check it out. The first day we received the cover, we put a glass on it (gently) and it scratched the surface. We were quite shocked to say the least – it seemed whatever was placed on it scratched the cover – even the plastic from a loaf of bread made drag marks that won’t come off. The photos are very misleading as it really doesn’t look good with all the scratch marks. Very disappointed – and we’ve only had it a week! Hi Pat. We’ve had our cooktop cover for six years now, and it has some surface scratches from use, though nothing deep. I don’t see how my photos could be misleading, they show the product we purchased six years ago. 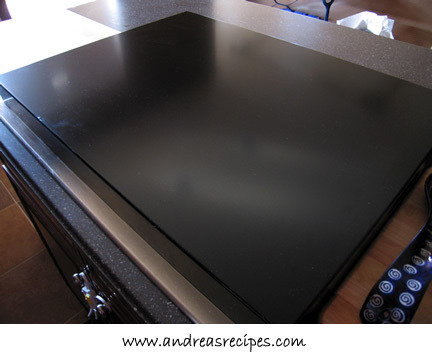 If you are concerned about the quality of your cooktop cover, you should contact the company.